Gwyneth and Monko are evolving. 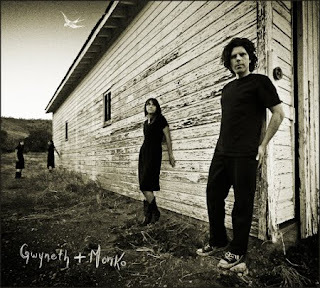 Their new record, Gwyneth & Monko, which was recorded at Old School Studio in Caspar, CA, will more accurately reflect what the duo sounds like live, which is somewhere between folky acoustic and indie rock. And it’s no wonder their new work sounds this way, as they’ve been on the road for most of 2010, taking weekends here and there to record. Guest artists Scott Southard on bass, Jimmy Gallagher on drums and Matt Cooper Borkenhagen on pedal steel and dobro, join Gwyneth and Monko on their self-titled album which will be released on February 15th, 2011. This record exists in part because of a month of creative exploration. In July, Gwyneth Moreland and Michael Monko spent time honing new songs in a home recording studio. Those sketches came to life in Old School Studio and are filled with new elements: Moreland on banjo, Monko on fiddle and guest artists adding drums and bass. These additions allow Gwyneth and Monko to explore a different dynamic while still keeping the old-timey and Americana influences, songwriting style, Moreland’s vocal style and Monko’s intricate instrumentation. In July, Gwyneth and Monko released their EP, Good Old Horse, which evokes a feeling of nostalgia rooted deep in classic country fundamentals. Their first release as a duo, it breathes gently with down-home roots and indie folk sensibilities. Lead singer Gwyneth Moreland and multi-instrumentalist Michael Monko create intimate, pure and heartfelt songs infused with sentimental lyrics.